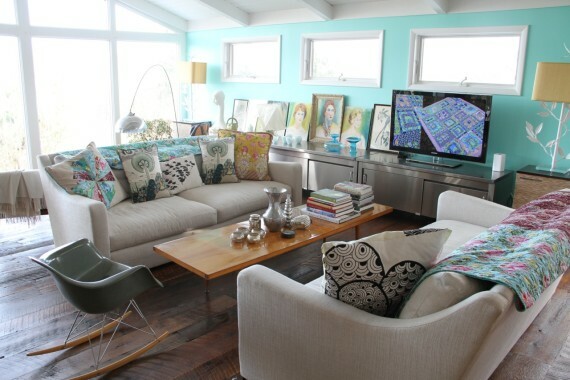 A new year is a perfect time to have a little fun with a quick family room refresh! I’ve been itching to get behind my sewing machine and stitch up some pillows and throws using my new Hapi quilting cotton and linens. This is a tradition for me, I love living with my prints and using my fabrics as a springboard for tweaking our living spaces. My friends joined in, and in a short amount of time, I redecorated our space with fresh textiles and favorite treasured objects from our collections around the house. Personalizing your space is important, and having it be a reflection of the things in your life that add meaning to every day is grounding and inspiring! Follow along as I tour you through our transformation. Our neutral linen couches are the perfect backdrop and allowed us to change and rearrange our textiles easily. In the “before photo” things are looking a little tired and spare. Don’t get me wrong, sometimes sparse is what’s needed, but I tend to enjoy adding layers to our most lived in spaces. This makes it feel inviting and cozy. This photo shows our lounge area post-sample sale, and since we sold many of my pillows and quilts with my older fabric collection, we were left with a design story that needs some love. Enter HAPI! This is just the love this room needed. I mixed several handmade Hapi pillows and throws with a few neutral IKEA pillows. 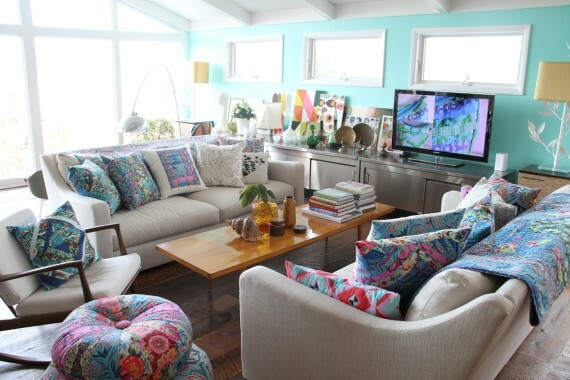 This allowed us to have a bit of contrast between the color rich Hapi textiles and the IKEA pieces. This works great because the IKEA pillows offer a nice visual break from the bold Hapi fabrics, allowing them to sing even more! I grabbed Dave and we took cues from the fabrics and scoured our house for other objects of art, books, and glassware that would compliment the color story we were building. By including a variety of materials that were related and felt good together, we were able to create an inviting space that would encourage cuddling and conversation. Dave is an incredible stylist and he really has an eye that is amazing! 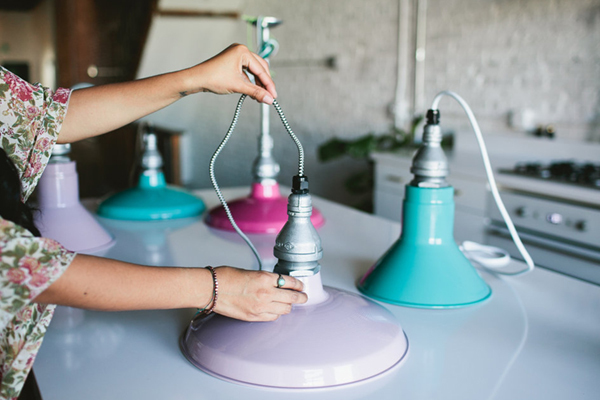 We love repurposing spaces in our home, and also love curating meaningful collections. 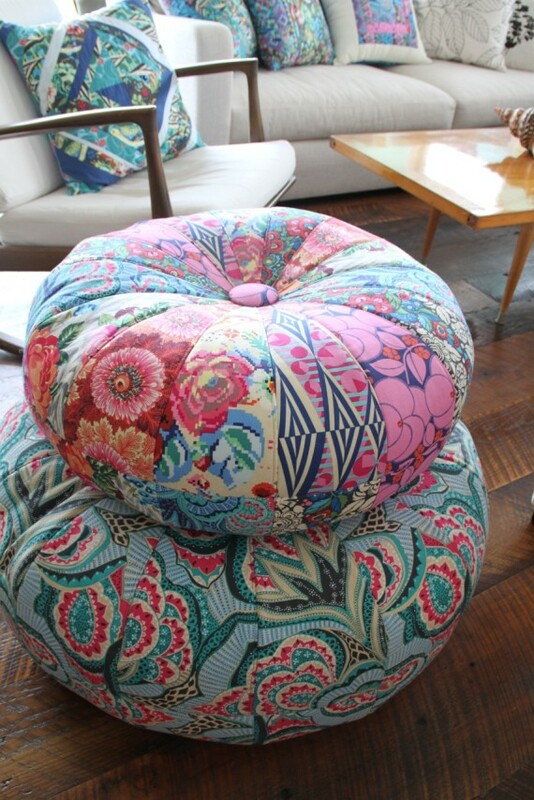 My Honey Bun Poufs are fun and colorful and are great for creating extra seating that is bright and comfy. If you are a pet lover like us… you’ll find your small dog or kitty will love them too! 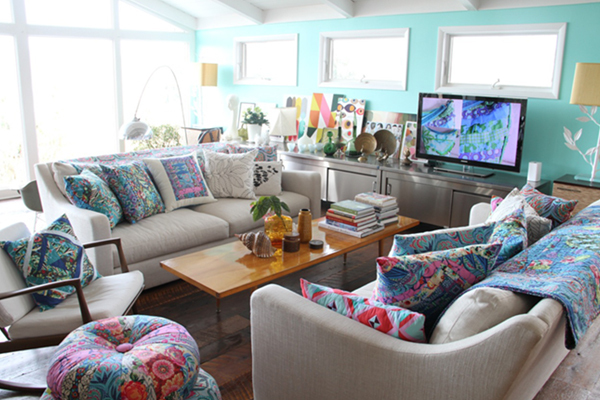 My bright cotton fabrics bring a lot of love to any space! 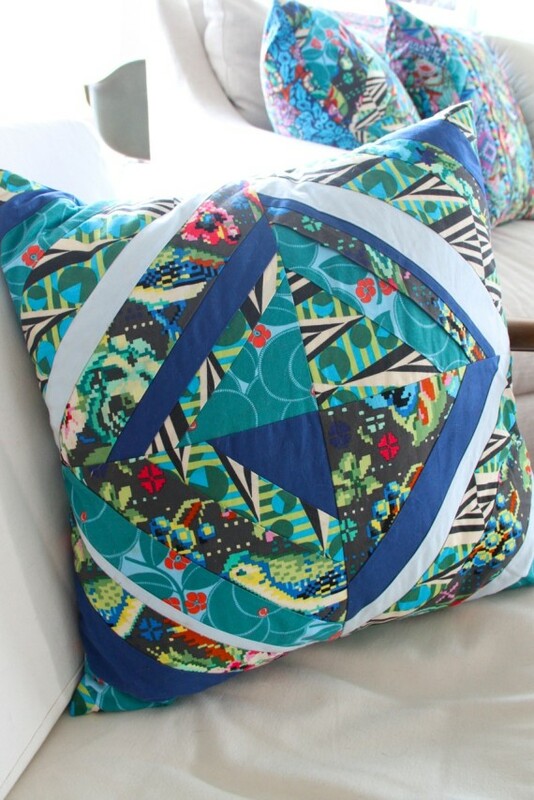 I had a blast piecing these simple pillows together using scraps of solids and my Hapi prints. 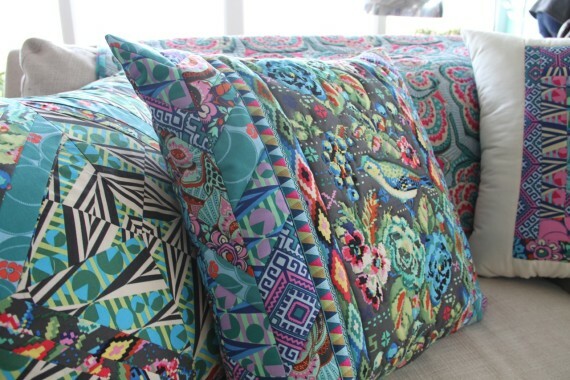 For easy-breezy instructions to make your own fabulous pillows see my Hapi Creative Suite pattern that just launched! You can make these pillows and many other wonderful home and accessory projects. 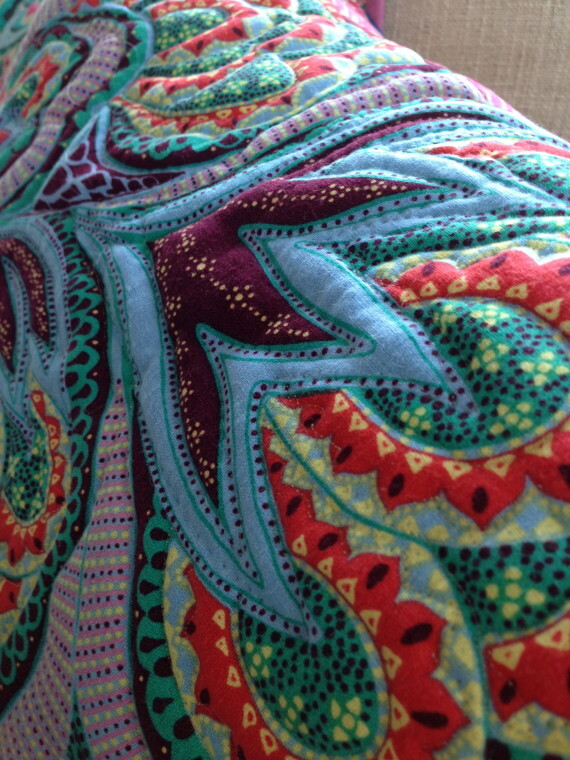 Here is another fun pillow using my Hapi pieces of cotton. This is a particularly lovely piece with the added details that include simple piecing and quilting with decorative embellishment from my Renaissance Ribbons. 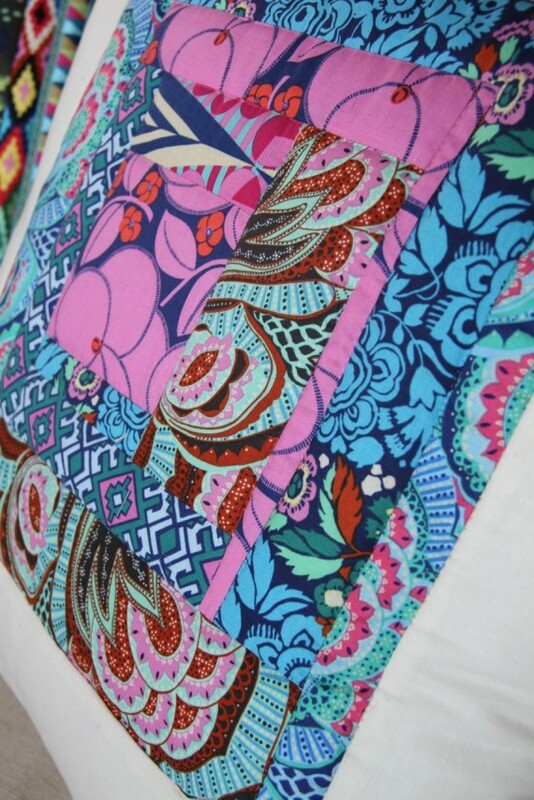 Here is a detail showing simple machine quilting stitches that follow the organic shapes in my Hapi linen fabric. As a kid from the 70’s I have great memories of my grandmother’s couch cushions stitched in a similar fashion. I find the quilting adds a bit of a luxe feel to the pillows. Dave and I love to hunt special finds at local flea markets and antique shows. 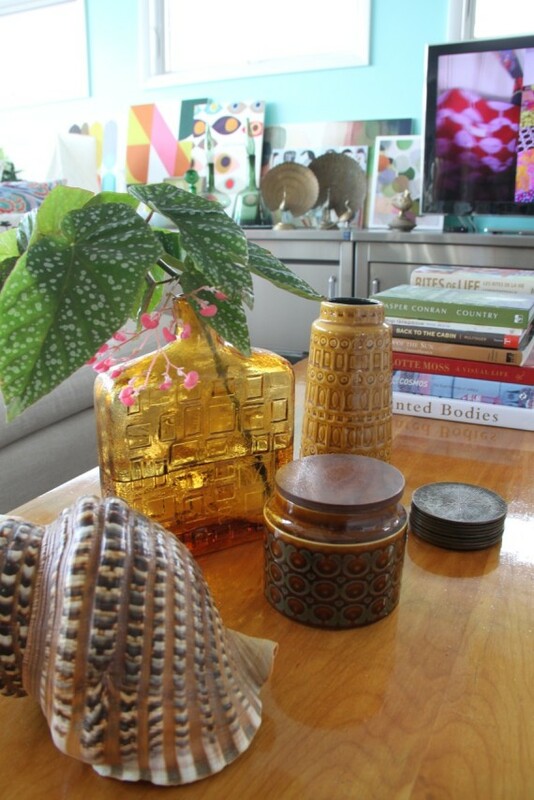 We have a thing for mid-century glass and pottery and these pieces mix in nicely with our textiles and natural finds. I saved this begonia stem when I dismantled my outdoor planters this fall. This little guy is happily rooted in and is giving us that hit of fresh green to brighten our Ohio winter days. 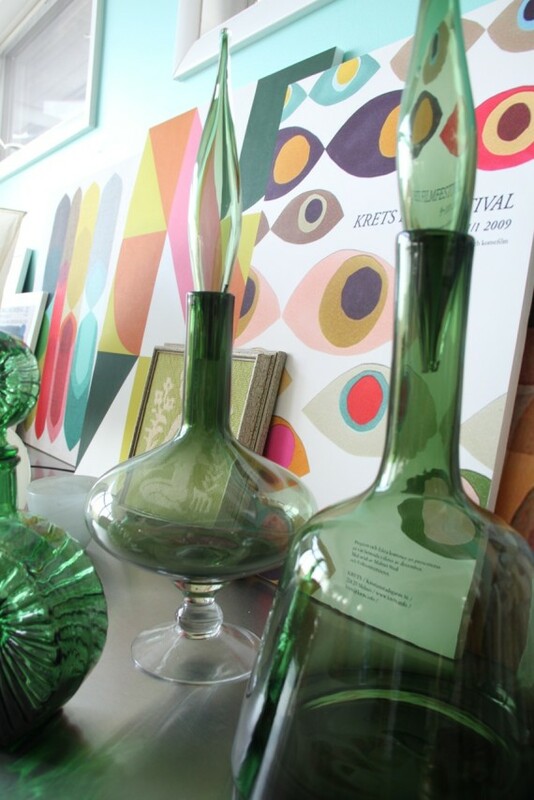 More mid century glassware combined with mounted art pieces from one of our photo shoots. We printed the graphics and gave them a clean mount on classic foam board that we recycle over and over again. We love layering and mixing the 2 and 3-dimensional art pieces. 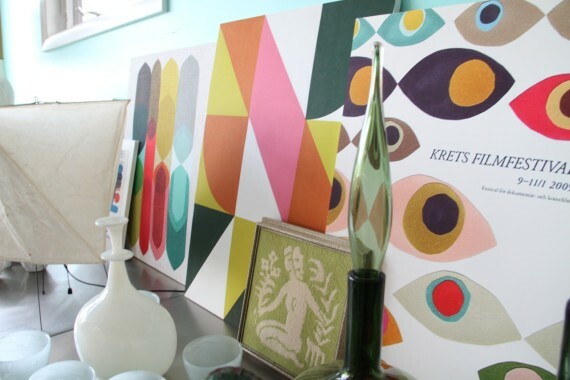 Print combinations like these are great for inspiring color choices for decorating. When we have open spaces that flow one into the other we often carry through one or two colors that harmonize the color feel from room to room. Did you really think you were going to see a post from me that didn’t have a cat in it? 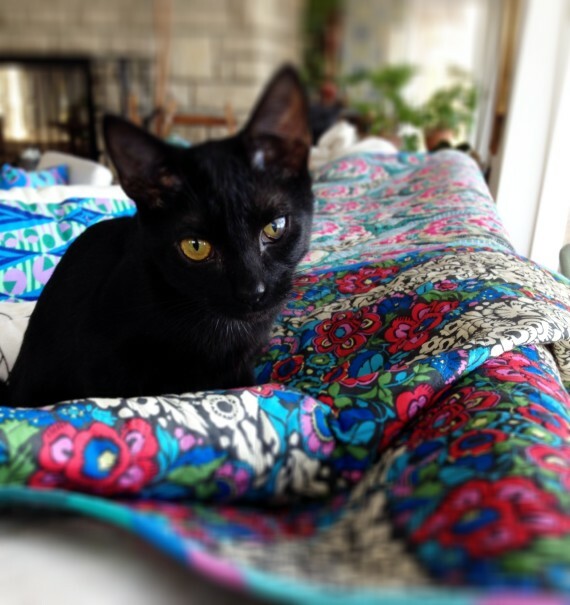 I’m thrilled to introduce you to one of our new rescue kitties TUTU!! Your decorating is on the right path if your cats or dogs lay all over everything. I can assure you our lounge is cat-approved and cuddle-ready! Thanks for spending time with me today and Happy Decorating! Amy Butler is a creative designer known for her sophisticated yet relaxed modern approach to printed fabrics and products for home, fashion and craft. She works from her studio in Central Ohio with her husband David, 4 cats, and a small staff of amazing friends. 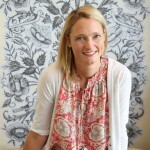 Her fabrics, patterns, handbags, design and project books & home decor products are sold worldwide. Please visit www.amybutlerdesign.com to find out more.